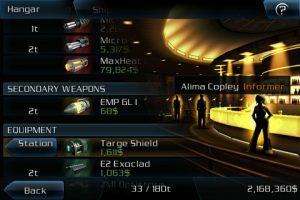 It’s rare to come across a portable game that has the deep, big-budget experience of Fishlab‘s Galaxy on Fire 2. 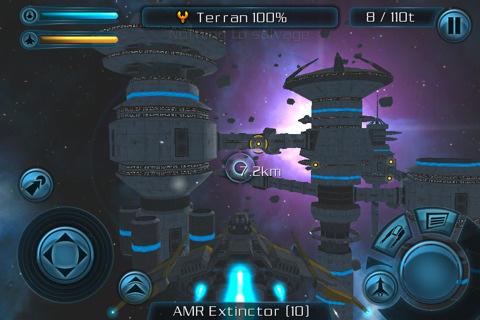 Reminiscent of games like Colony Wars or Eve Online, the game puts you in the cockpit of a space cruiser in deep space where you’ll mine asteroids, fend off space pirates, and trade goods with intergalactic space merchants. There’s so much to see and do here that it’s easy to get overwhelmed. But players who stick with Galaxy on Fire 2 will come away with a rewarding experience that will last for hours. Pilot Keith T. Maxwell returns from Galaxy on Fire 3D in an all new adventure that finds him stranded on the other end of the galaxy and thirty-five years in the future after being sucked into some sort of wormhole. Eager to get back home, Maxwell immediately sets off to…mining asteroids. Yes, Galaxy on Fire 2 starts off rather slowly, and what appears to be a fast-paced space shooter contains extended periods of mundane activities. But these slow spots are merely means to and end. In order to upgrade his ship, defeat a mysterious threat, and make the journey across the universe and back home, Maxwell needs to earn money by taking on various missions, only some of which include plucking ore out of floating hunks of space-rocks. Other missions will require Captain Maxwell to trade goods and minerals, and create new items, giving the game a serious role-playing vibe. But if this all sounds like some sort of dull farming simulator, fret not. Maxwell is a space pilot, and much of the game is spent working as a mercenary or pirate, which usually translates to blasting ships out of the galaxy. 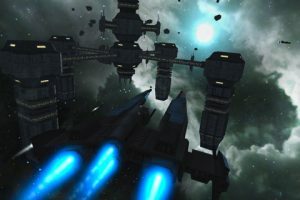 The production quality of Galaxy on Fire 2 is outstanding, oftentimes reminiscent of the excellent Rogue Squadron games. Your missions will be played against some lovely backdrops, with colorful planets, stars, and nebula making for gorgeous scenery. Much of the dialog is voice-acted and the audio is on par with what one would find on a home console. But it’s not all perfect. As well as the game is presented, Galaxy on Fire 2’s controls take some serious getting used to. Players are given the option between touch and tilt controls, though neither ever felt comfortable for me. The tilt controls were loose and somewhat unresponsive, and touch controls rarely feel right for this type of game. Often, I’d find myself chasing a blip on my radar only to zip past an enemy ship as I fumbled to find the appropriate on-screen “button”. So despite how deep the game is, and no matter how impressive its production value, the cumbersome controls often resulted in missions ending in frustration. In addition, the ships lack a throttle, meaning you’re basically going the same speed at all times. This makes the travelling sections incredibly tedious, and if you’re in the middle of a battle and your enemy is at a great distance it may seem like an eternity before you make contact. In the end, Galaxy on Fire 2 is really a mixed bag. On one hand, the presentation is top-notch, the missions are varied and plentiful, and the story will keep gamers interested until the very end. On the other, clunky controls and slow-paced gameplay often stifle the otherwise excellent package. 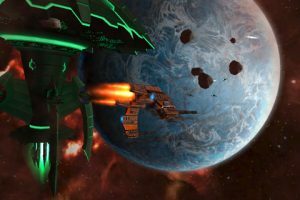 Bottom Line: While great for space shooter enthusiasts, Galaxy on Fire 2 impresses with its variety, length, and production, but disappoints with its pacing and control scheme. 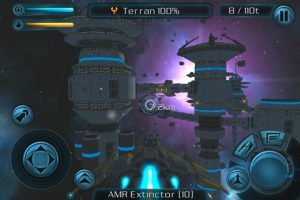 Galaxy on Fire 2 is compatible with iPhone, iPod touch, and iPad. Requires iOS 3.0 or later.